Advances in technology bring implications for mortality and longevity trends. 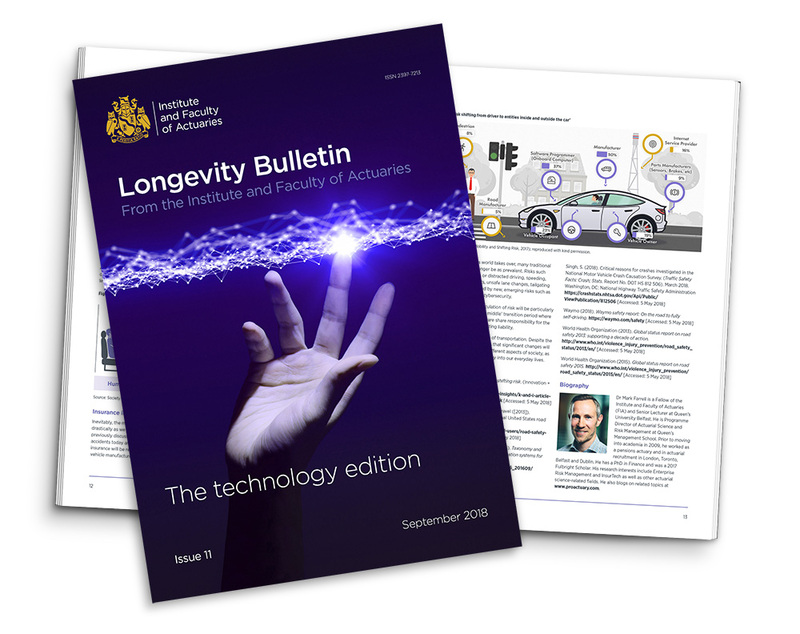 This edition of the Longevity Bulletin examines a range of technological developments and highlights key issues for consideration as the relationships between society and technology continue to evolve. The Longevity Bulletin aims to provide an overview of research on some of the biggest challenges facing policymakers and society in the context of longevity, ageing and population change. It presents and explains actuarial perspectives on population longevity and looks beyond the actuarial world for statistics, research and the latest thinking on related subjects, providing general and technical perspectives to address relevant topics. The Internet of Health Things: Is the rapid growth of the use of devices, products and services to enhance health and well-being a game-changer for the healthcare industry? We look at the opportunities and challenges involved, as well as providing an update from the IFoA’s Working Party. Community-based self-care: As digital technologies play a growing role in the emerging practice of self-care, this article outlines their application and limitations, highlighting the need for face-to-face support infrastructures. e-Cigarettes: What are the impacts of the use of e-cigarettes on health and behaviours and how can these be assessed from an insurance perspective? The IFoA’s Working Party provides an overview of its research. Autonomous vehicles: Driverless cars are now a reality. This article looks at some of the main implications, with a particular focus on the potential for reduced mortality and morbidity from traffic-related accidents and the redefinition of risks in vehicle insurance. Life extension technologies: If human life could be extended by biotechnical interventions and in alternative forms, how might society and insurers respond, and can the stuff of science fiction help actuaries and others in considering how to deal with disruptive technology? Download the Longevity Bulletin 11: The technology edition. We welcome your feedback on this latest edition of the Longevity Bulletin, and are always open to suggestions for possible future topics. The IFoA’s Mortality Research Steering Committee is also keen to ensure that the IFoA’s mortality, longevity and morbidity research agenda is addressing relevant issues. Please take the opportunity to share your thoughts by completing a short survey – it should take no more than a couple of minutes to complete.